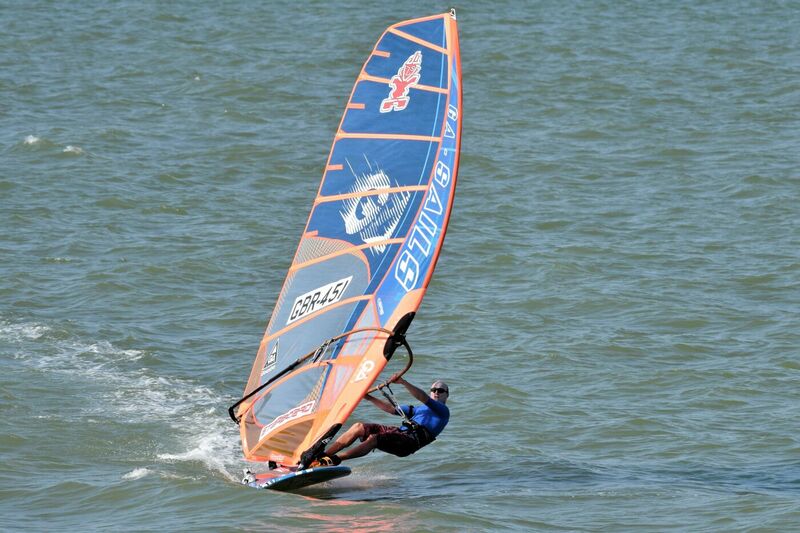 For many years in the 1980’s and 1990’s, Corpus Christi’s Oleander Point was the site of the US Open, the brainchild of local windsurfing pioneer Charles Allen and a highlight on the international racing circuit. With the vagaries of event scheduling and competition from other venues, Oleander Point fell off the map a little. 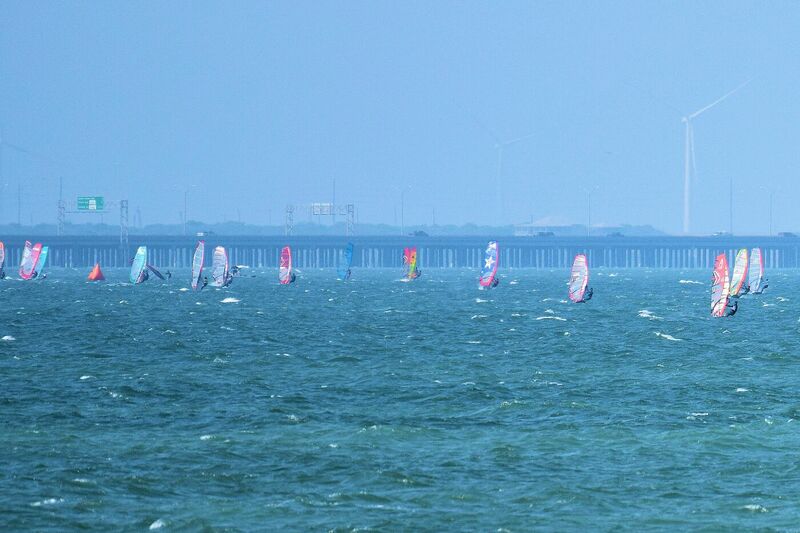 It’s a technical venue, with strong breeze and steep cross-chop, and for recreational windsurfers in the area, or those traveling to the region on vacation, the spot became an afterthought on the way to Bird Island Basin in Padre Island Seashore National Park – a much less intimidating location with shallow water for miles and a fantastic windsurfing school to boot (Worldwinds Windsurfing). 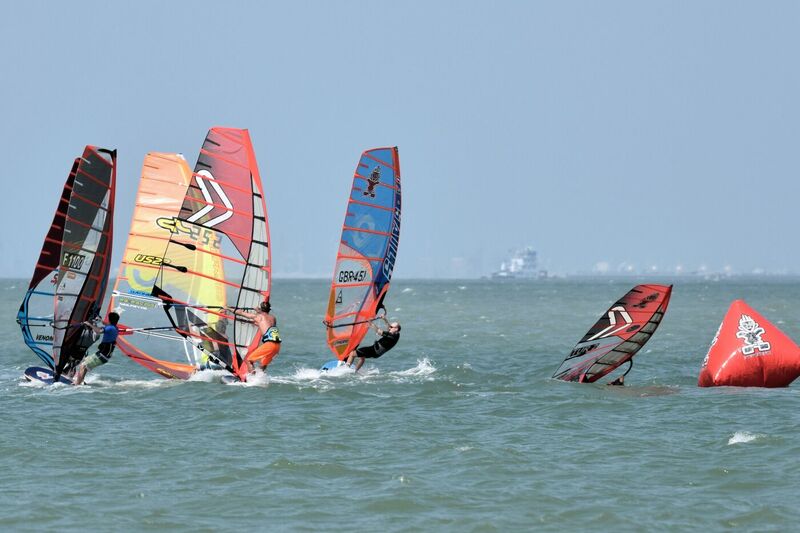 But the wind hasn’t stopped blowing on Corpus Christi Bay in the past decade, and when we awarded the 2016 US Nationals to the area, we wanted to introduce a whole new generation of rippers to the high octane conditions at Oleander Point. Locals Olivier Jallais, Terry and Monika Caldwell seized this opportunity to showcase the venue that made Corpus famous in the world of watersport enthusiasts, enlisted the help of good friends at the Corpus Christi Yacht Club down the road, and it was off to the races from there on! 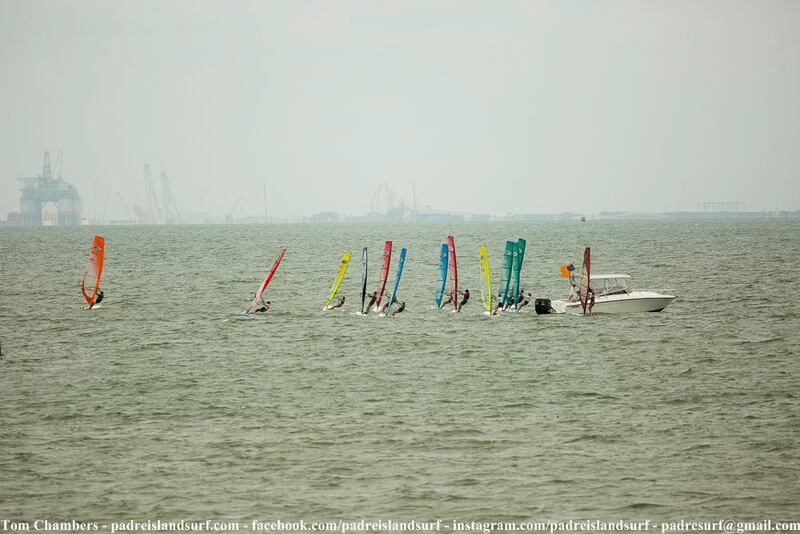 The event started with wind in the 15-20 kts range, and unsure of what the next few days were going to bring, the organizing committee made the terrific call to jump right into full-on double-elimination slalom heats. 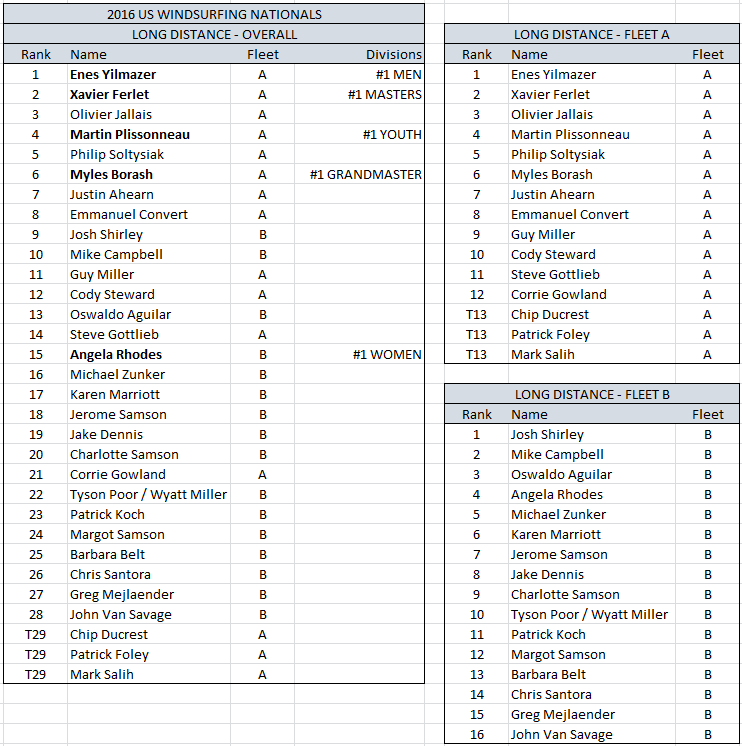 Another great call was to scrap any distinction between slalom A and B fleets, and get everyone (regardless of skill level) to race in the same elimination brackets. With proper seeding to lead each heat, the best racers had little trouble plotting their way to the finals, but it gave novice slalomers a chance to race side by side with some of the best in the business. Each heat even had its sprinkle of Kona racers duking it out with slalom boards! Racing legend Steve Gottlieb (who won the Techno title here 16 years ago!) even made the final of the 2nd elimination on a Kona, on his way to the grandmaster title this year! At the front of the pack, freestyle pro Phil Soltysiak (Toronto, Canada) showed he’s got plenty of tricks in his quiver and won the first final ahead of seasoned slalom racers Xavier Ferlet (Los Angeles, CA) and Tyson Poor (Hood River, OR). The second full elimination was won by PWA star Enes Yilmazer (Corpus Christi, TX) ahead of Wyatt Miller (Berkeley, CA) and Tyson. 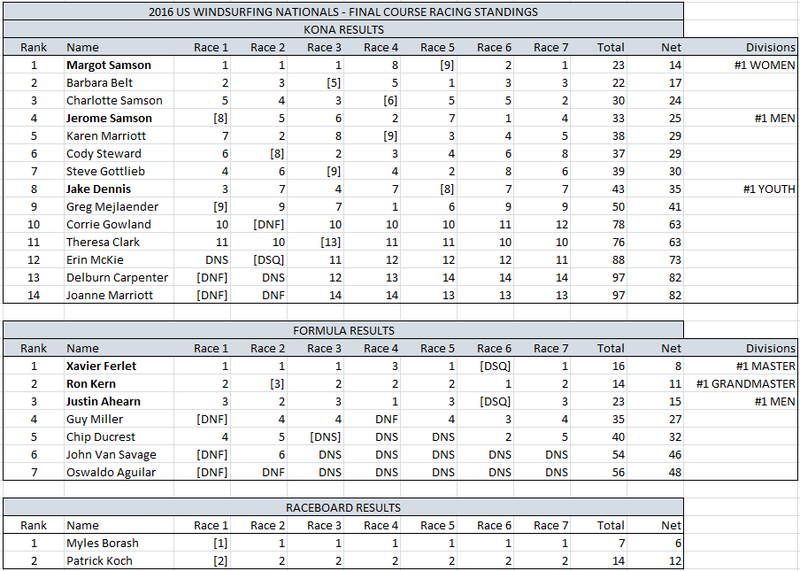 Added together, Phil edged out Tyson and Xavier to take the 2016 US Nationals title in Slalom, ahead of a talented field and a top-five all within 3 points of one another! This ‘blurring of the lines between fleets’ set the stage for an epic 6-mile long distance race along the city front on day two, in similar 15-20 kts conditions, with all types of boards and rigs mixed in again on the start line. Tyson and Wyatt even did the race on a tandem board (and finished mid-fleet too!). A quick Defi-like rabbit start right in front of all the spectators on the bluff got everyone really excited, and it wasn’t long until Enes showed his speed and mastery of the local breeze and chop. 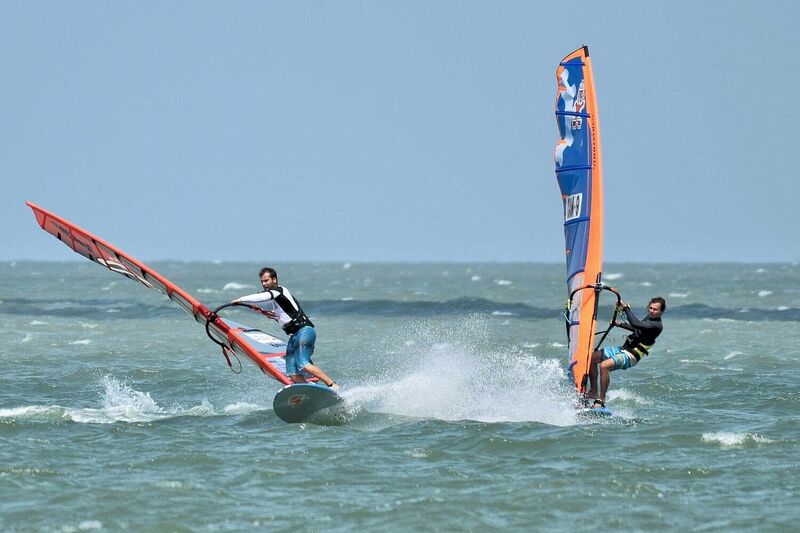 Enes was flying out to Korea the day after the event for the first stop on this year’s PWA slalom tour, and his fellow PWA competitors are on notice that Enes has the speed early in the season to be a force on tour this year! The event also saw plenty of course racing action in the building breeze each day at Oleander point, with a grand total of 7 races completed for Konas and Formulas. A couple of raceboards even joined the Kona starts – not enough to make it an official fleet, but it was cool to see them mixing it up on the course nonetheless. 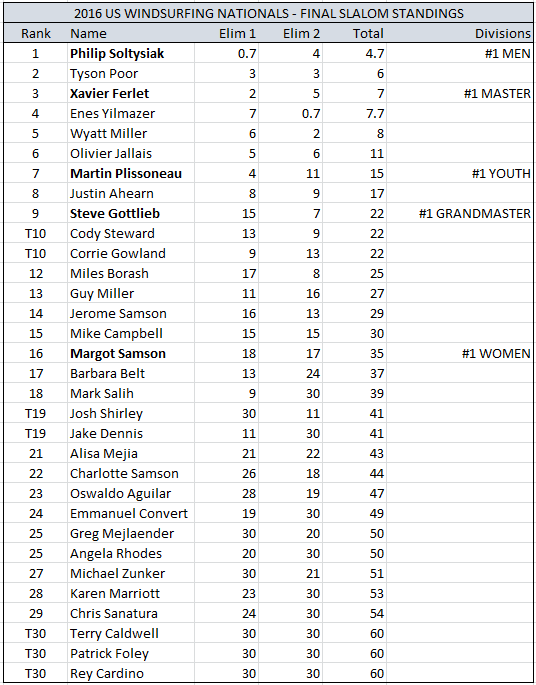 Margot Samson (Clearwater, FL) started off with a pair of bullets on day two to set the tone for the Kona fleet, but she was caught by Barbara Belt (Houston, TX) after three challenging races on day three, and it all came down to the wire on day four! Those two hard-charging women have Olympic campaigning in their pedigree and that experience under pressure definitely showed on the race course! Margot only cemented her victory with another bullet in the last race of the regatta, and her sister Charlotte performed consistently all week to make it an all-women podium at this year’s US Nationals! With Kona Worlds in Florida this year (Oct 28 – Nov 2), the boys will need to bring their A-game! 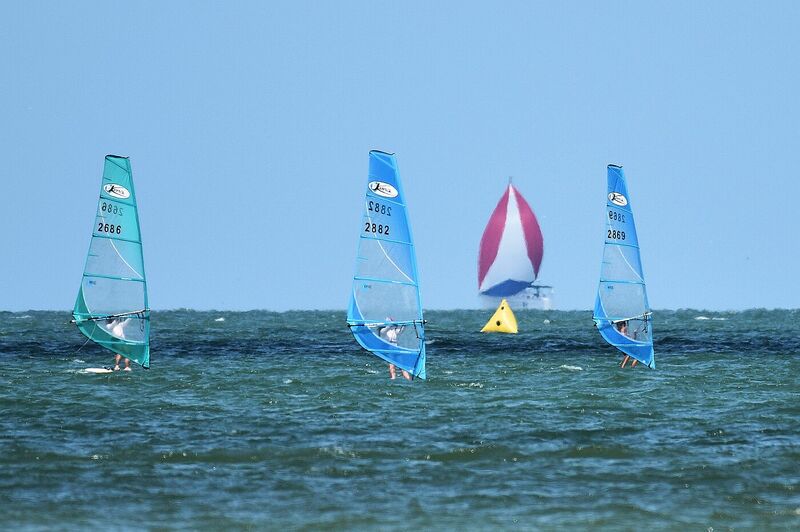 Up and down breeze and holes on the course made the conditions very challenging for the Formula fleet – and those conditions are fast to separate the fleet in the high speed Formula class. Xavier Ferlet (Los Angeles, CA) was unfazed. The 2014 US Nationals champion (and runner-up last year) was too fast for the rest of the fleet this week, and the real battle happened right behind between Ron Kern (Fort Lauderdale, FL) and Justin Ahearn (Clearwater, FL), who are always a couple of points apart in every regatta they attend and were hard at it again this week in Corpus. It took a mistake by Justin on the penultimate race of the event (rounding the wrong windward mark!) to give Ron the breathing room he needed, and he sealed the deal with the next race to finish in 2nd place (and 1st Grandmaster) behind Xavier. 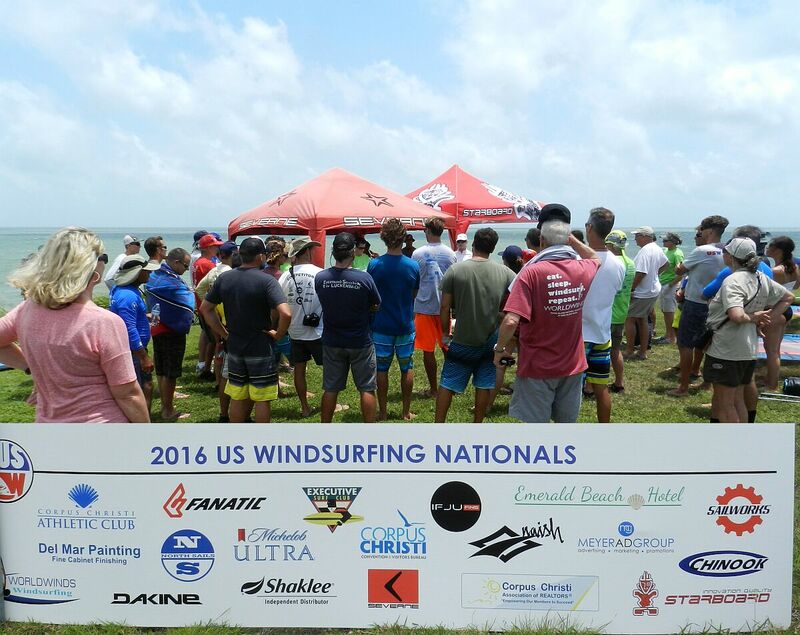 Many non-competitors joined the fun on the last day of the event, and even though the wind was too light by then to get a fun race going for them, they had a great time zipping back and forth, trying new gear and soaking up the atmosphere of the National Championships! And this is probably one of the strongest takeaways from the event this week: yes, it’s a high-stakes event for competitive riders, but more importantly it’s a windsurfing festival for all. 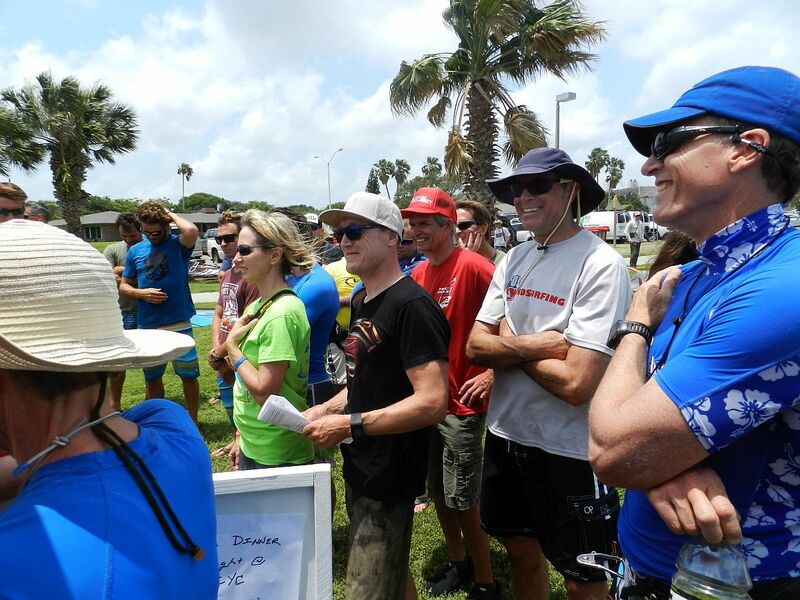 The objective is to lower the intimidation factor, introduce newcomers to the racing scene, and bring together windsurfing disciplines that rarely get a chance to rub elbows with one another. Judging from the vibe at the awards ceremony at Executive Surf Club last night, it’s safe to say that Olivier and his team achieved those goals – and then some! Big props go to Olivier and Monika for orchestrating the event, Principal Race Officer Shannon W. Bush and the Corpus Christi Yacht Club for being spot-on on the water all week, Terri, Robin, Todd and all the volunteers for keeping all proceedings on track and being such gracious hosts to all competitors, the city of Corpus Christi for all its support, and all the wonderful donors and sponsors who made it all possible. Corpus is back on the map for sure, and the wheels are in motion already to make this fantastic venue a regular stop on the US National Slalom Racing Tour starting next year! Skipper’s Meeting and Event Sponsors at Oleander Point! Smiles all around at Oleander Point! Next story Busy Slalom Season Gets Underway in the Bay Area! Previous story Banana River Resort Delivers Perfect Conditions for Arrianne Aukes Clinic!